Most high school coaches encourage or allow their kickers and punters to spend the majority of practice kicking and punting. This leads to under performing, lack of focus, and possible injury. Kickers and Punters are synonymous with baseball pitchers. Just as a pitcher has to count pitches per work-out so as not to fatigue his arm to levels of poor performance and possible injury, a kicker/punter also has to count kicks/punts so as not to fatigue his leg to levels of poor performance and possible injury. Most of the heavy kicking/punting should be done early in the week. Wednesday should be a very light day of kicking/punting. Preferably, there should be no kicking/punting on Thursday ( the day before the game on Friday night ). Most high school coaches schedule a total special teams review on Thursday, and wear out their kicker/punter 24 hours before game time. This is obviously counter productive to preparing the kicker/punter to be fresh for the Friday game. Many of these special teams plays can be accomplished without the kick or punt. If the head coach cannot live without actual kicks/punts on Thursday, try to keep the reps down to a minimum. Most high school coaches encourage or demand fast get-off times for kickers on their field goals/extra points. The danger of speeding up the kicker too much... he gets out of TEMPO. Every kicker, punter, golfer, pitcher, batter, etc., has a specific tempo in which they maximize their action. For a kicker, the timing and tempo of his approach and swing are paramount for his best kick. Get a kicker out-of-tempo by asking him to come in too quick, he will become inconsistent. A good field goal get-off time in the NFL is between 1.23 seconds and 1.33 seconds. Many high school coaches are asking their kicker to go sub 1.23 seconds. Asking your kicker to go this fast will cost the team a few missed kicks, because your kicker is out of tempo and does not get a good look at the ball. In addition, the holder is now speeding up and becoming sloppy with the hold. A good punt get-off time in the NFL is 1.9 seconds to 2.1 seconds. Realistically, high school punt operation should be in the neighborhood 2.1 to 2.5 seconds. *** Not a bad idea to move your punter up to 14 yards behind the long snapper. This adjustment makes it an easier snap, and gets the ball into the punter's hands earlier. Most high school coaches love touch backs on kick-offs, but do they know a great rule to assist their kicker in getting the most distance possible??? A huge advantage in high school football...the kicker has the freedom to bring out his personal football for the kick-off. The official must see and approve the ball before each kick-off. The kick-off ball should be extremely broken-in, but still have the white stripes visible, and look somewhat decent. This rule of allowing the kicker to kick a well worn, well broken-in ball... is a HUGE advantage. The right ball will lead to more touch backs. ( FYI: Have 2 kick-off balls ready in case one gets damaged or misplaced ). Coaches, do you want to maximize the performance of your specialists? 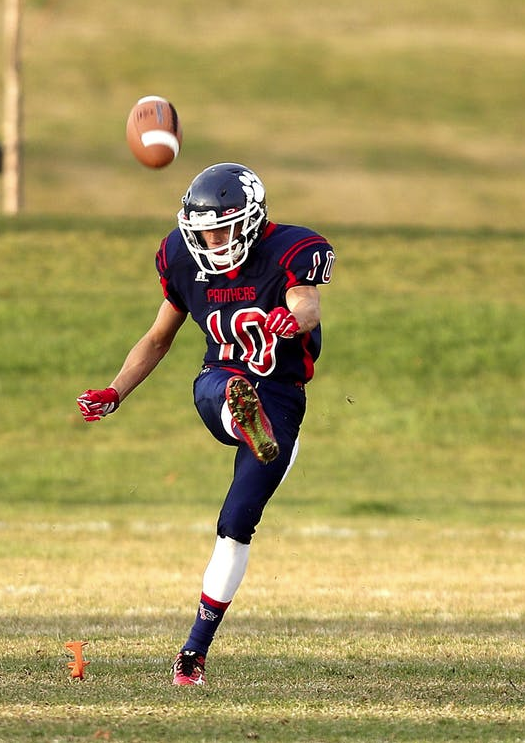 Do you know the best coaching points to offer your kicker and punter? Do you want to teach your specialists professional drills? All this information and more are available in the program: "Kick, Punt, and Train Like a Pro", developed by 23 year NFL veteran John Carney. In-season, limited time offer 30% off. Order now, time is running out!